We would like to announce the closure dates on holiday. for one reception is just a 240 €! He is a member of the Czech Dental Chamber. Spetsialist in endodontics by using an operating microscope, microprosthetics by CEREC technology, implant prosthetics, office whitening by the ZOOM system, aesthetic prosthetics by the Componeer system. Rostislav in 2004, was educated as a general practice dentist . In 2006 he graduated from the internship in the field of therapeutic dentistry. In 2008 - passed a specialized course in the field of endodontics with using an operating microscope. 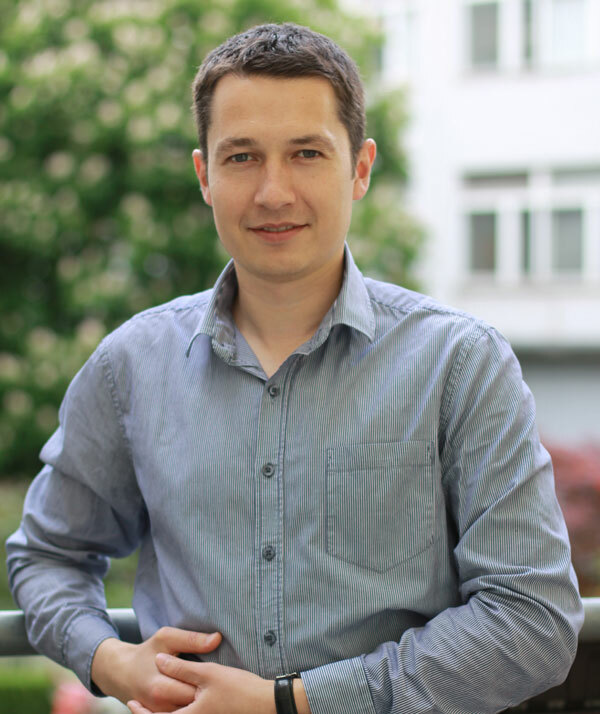 In 2014 - passed a basic course for CEREC technology: the production of indirect restorations, inlay, onlay, overlay and prosthetics on implants.In 2015, Rostislav has successfully passed the examination in the Charles University in Prague, and confirmed his qualifying degree in General Dentistry. In 2016: a course participant on the aesthetic prosthetics system of composite veneers Componeer (Prague, March 2016). We use the approach of preventive dentistry in which our patients twice a year have a check and do professional oral hygiene (75 euros) with an emphasis on early diagnosis of initial caries by using an operating microscope and X-ray Information. Initial consultation includes a clinical examination of the oral cavity, panoramic X-ray of the upper and lower jaws, filling medical documentation, scheduling of treatment and financial calculation. With an integrated approach, which apart the treatment involves the implantation and prosthetics is used computed tomography, intraoral photography and Portrait shooting, diagnostic digital impressions.This integrated approach allows us to properly plan the entire spectrum of medical, surgical and orthopedic interventions. The patient receives a individual treatment plan and financial calculation. 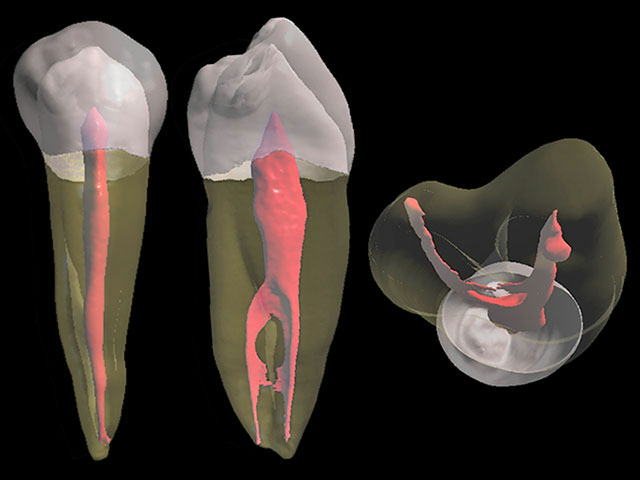 the destruction of teeth crowns less than ˝ of their volume - used light nanocomposites. The cost of filling 95-145 euros. at destruction of teeth crowns more than ½ of volume are used the new generation of glass-ceramic fillings by the CEREC technology. Ceramic filling on the structure and strength is identical to the natural tooth enamel, allowing to achieve excellent esthetic results and long-term life of restoration. In the case of penetration infection to the the tooth cavity and inflammation of nerve is showing the root canal treatment. Teeth with treated root canals must be strengthened. fiberglass pins, that are fixed in the channel and are the continuation of the root for a more uniform load distribution on the tooth followed by coating with composite filling. 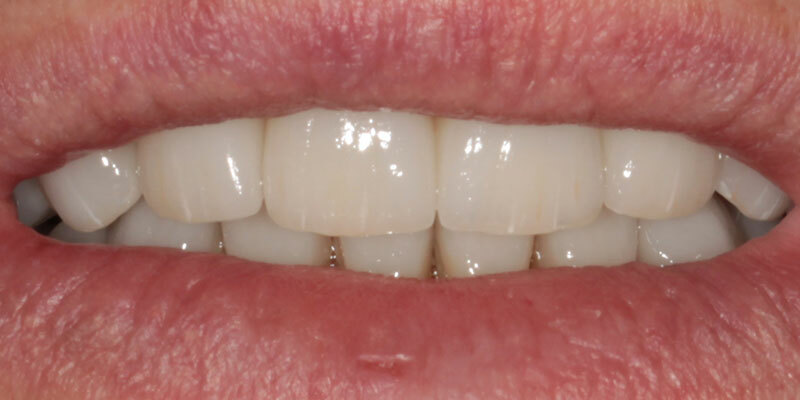 occlusive ceramic plates with overlap of the all chewing surface minimum of 2 mm. Patients with increased abrasion of hard tissue of teeth, suffering from such diseases as bruxism, often turn to the clinic with complaints of pain in the joint and chipping ceramic and composite restorations. Typically, for such patients are preparing individual mouthguards. Mouthguards are worn only at night, and can not only keep your teeth and dentures, but also greatly reduce the work of the muscles, allowing them to relax and thereby reducing the risk of the effects of bruxism. Due to the softness and elasticity of the material mouthguards protect the teeth from damage and reduce strain on the jaw muscles and facial systems. Mouthguards are worn only at night, and can not only keep your teeth and dentures, but also greatly reduce the work of the muscles, allowing them to relax and thereby reducing the risk of the effects of bruxism. 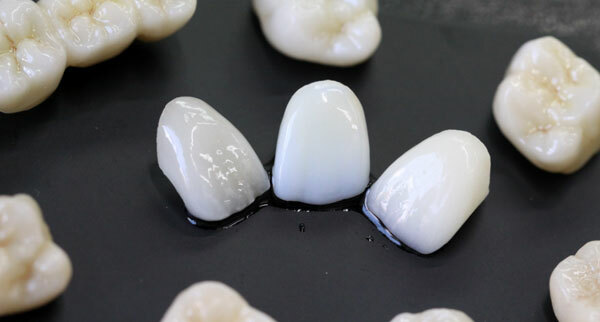 Using CEREC allows dentists to construct, produce, and insert individual ceramic restorations directly at the point of treatment in a single appointment. CEREC® is the best solution, which the modern dentistry has to offer to you. Thanks to CEREC® system, we are using a strong, solid ceramic material with the same shade and a structure similar to your own teeth. What are the advantages of CEREC®? 1. 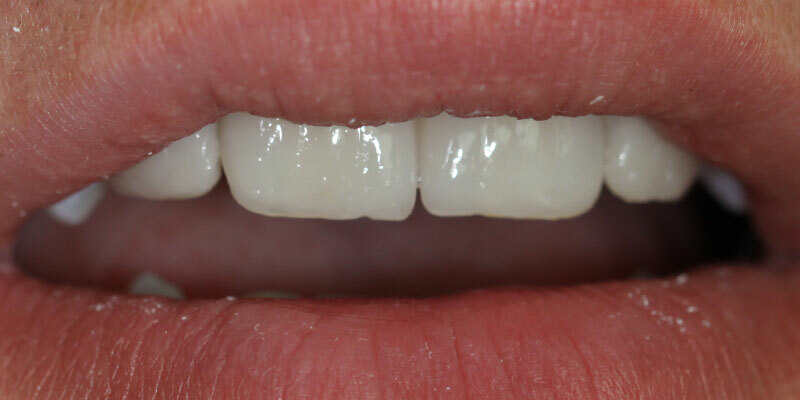 The patient can leave the office with new one ceramic restorations after a single appointment. Independent scientific studies have confirmed that CEREC® reconstruction are comparable to gold in terms of their lifetime. The Arcus Digma2 from Kavo represents the next generation of innovative, practical diagnostic technologies. The ARCUS Digma2 measures and records the movements and positions of the patient’s jaws. These values are then used by Kreativ’s on-site laboratory ensuring a precision fit and efficient production of restorations. In combination, the ARCUS digma and the Protar articulation system offers the dentist and the laboratory technician a simplified approach to creating a more aesthetic and functional prosthesis. The Wand® STA® is the first & market-leading computer-controlled local anesthesia system, with over 50 million injections performed worldwide. The Wand® STA® performs all dental injection techniques in a more effective and comfortable way for both the patient and the provider. This new technology allowed fluid pressure and the solution flow rate at the needle tip to be controlled and monitored during the injection procedure.3 Dynamic pressure-sensing technology works to decrease the pressure needed to introduce the anesthetic into the tissues and the flow rate control allows more anesthetic to be introduced into the tissues. 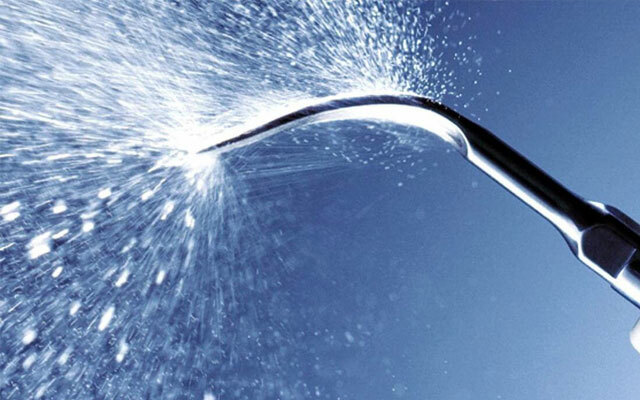 This new technology enables the dentist to give an easier, less painful dental injection. Because the STA System Intraligamentary Injection does not cause any pain or discomfort, the patient is less anxious. No matter what procedure the doctor is doing, he always need great visualization to do it. The dental microscope is the best way to achieve great visualization; the better visualization you have, the better results you get. Even at low power magnification, doctor is getting 100 percent more detail about what he is seeing compared to no magnification. A microscope benefits every procedure by helping our to better diagnose and predictably treat the patients. Better diagnostics with panoramic imaging or CT (3D) images begins with accurate, clear views of the patient’s anatomy. The GXDP-300 features proprietary FOX™ technology to capture well-defined, high-quality images — in an instant — with consistent magnification and image uniformity. Utilize VixWin™ Platinum with its powerful imaging tools to advance diagnostic capabilities and accelerate workflow. The EasyPosition system and instructive alignment guides appropriately place and stabilize patients of all sizes and complete our patient scans in just a few simple steps. 3Shape’s proven technologies are successfully servicing thousands of labs worldwide. New groundbreaking technologies provide revolutionary performance and productivity. Dental System™ brings together 3D scanning, CAD modeling, order management and communication tools. Improve treatment by combining all types of patient images such as surface scans, CBCT, face scans, patient photos, intraoral images and more. T-Scan® Novus™ is dentistry's only clinically recognized and research validated digital occlusion analysis system. Send our patients out the door with a brighter, more beautiful smile. Philips Zoom gives you a range of options for convenient and effective whitening. Thanks to an innovation in application methods, Philips Zoom QuickPro requires only a few minutes of chair time to whiten up to four shades. The new MD 30 implantology motor system is the convincing result of 40 years of research and development in the field of implantology. An outstanding solution, absolutely in line with our philosophy of providing implantologists across the world with complete systems that leave nothing to be desired. 10 stored programs for each of the two motors ensure smooth running during the procedure, thus guaranteeing safety and trust with every treatment. The BeeFill 2in1 is a 3-dimensional, dense and durable obturation of root canals. Best obturation results for every tooth. Piezotome Solo, the best of SATELEC® technology in a compact and accessible generator. It integrates the most powerful, reliable and safe components for a use dedicated to ultrasonic pre-implant surgery. Tento systém je revoluční metodou pro zhotovení zubních náhrad (protéz). Po vytvoření pryskyřice vykazuje vynikající estetiku a výborné mechanické vlastnosti. Unique system working on the basis of hot vacua to produce plastics material in the manufacturing of orthodontic appliances, such as carriers for teeth whitening, sports protectors, etc. Produced by the dental technician in an articulator, a dental prosthesis must function with-out a problem for the patient. An articulator is a great way to emulate the patient‘s move-ments, saving the dentist chair-side time and the patient quite a bit of pain. The reproducible centric rela-tion ensures safe starting and end positions of every jaw movement. This efficient autoclave for for sterilization in dental offices has the same record operational times as the almost identical Vacuklav 40 B+. 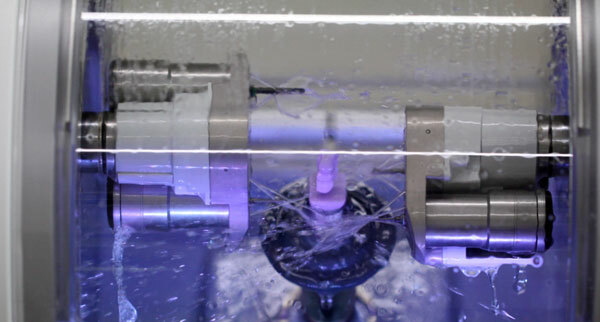 It is possible to remove unwrapped instruments after only 10 minutes and wrapped instruments after only 17 minutes, with the innovative twin chamber technology. The Pentamix™ Lite is a portable Autromatic Mixing Unit easy to carry thanks to its light weight and integrated handgrip. It is designed to work with all 3M ESPE Penta™ Impression Materials and consistently delivers a homogeneous, reproducible mixing quality for void-free impressions. The Programat EP 5010 is a furnace for the dental laboratory that combines high-tech and modern design in a very efficient and user-friendly furnace. In addition, the Programat EP 5010 is optimally coordinated with Ivoclar Vivadent press ceramic materials such as IPS e.max Press. It’s a new generation of technology combined Swedish and Italian style. It features excellent ergonomics, flexibility and functionality. The chair is designed to provide maximum comfort for the patient. Shooting of patient is a very important part of successful treatment and diagnosis. The perfect combination of speed and quality, the EOS 50D’s 15.1 MP CMOS sensor and DIGIC 4 processor deliver superb high-ISO performance, shooting flexibility and image quality without compromise. 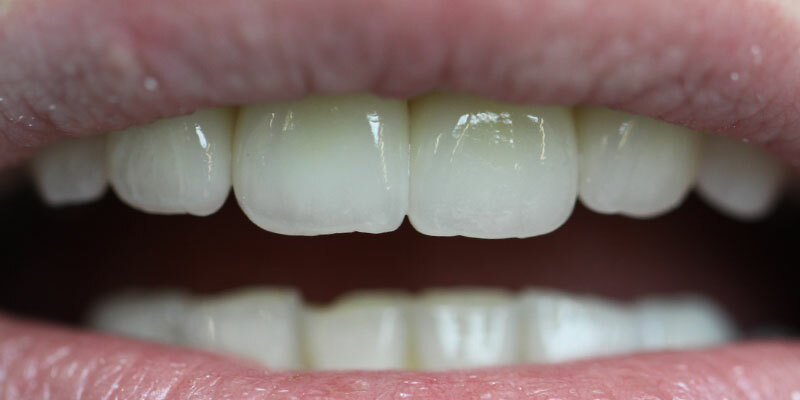 Composite veneers – Hollywood smile for 1 day! Hollywood smile for 1 day! The dream of a Hollywood smile has become a reality for everyone. BioDent Clinic offers an exclusive solution to your aesthetic problems - using componeers. 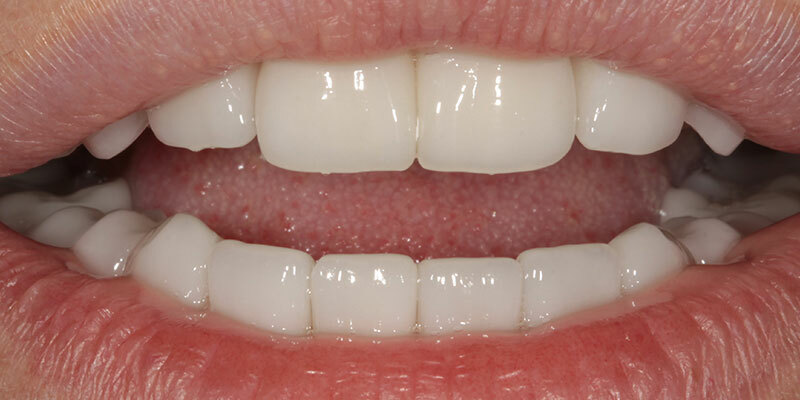 It is package offer that includes the installation of composite veneers on the front six teeth. The cost of 1320 euros. All procedures are conducting during for 4-5 hours. The price does not include dental care. Componeers – it is the thinnest (0.3 mm thick) plate of highly filled nano-hybrid composite material, manufactured by the Swiss company Coltene / Whaledent. This technology is used since 2012 and is widely using advanced dental clinics in Europe, which specializing in the aesthetics of the teeth. Componeers are younger brothers of veneers, currently compete with them, because veneers manufacturing is the longer and more expensive process. The cost of componeers is 2.5–3 times less than porcelain veneers and aesthetic result and quality can meet the most demanding patients. Componeers can not be compared with conventional composite restorations since they are industrially produced and have high strength and ideal form. 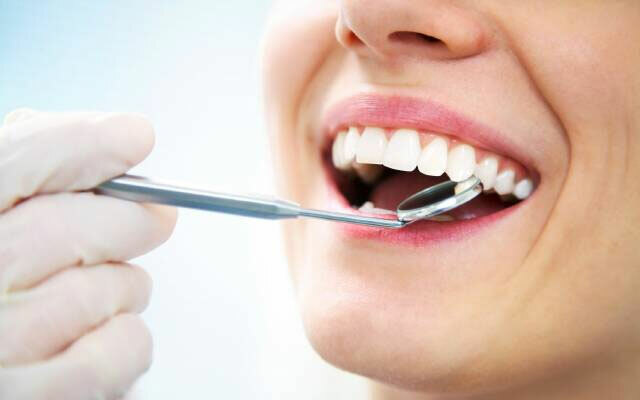 Componeers service life is not limited to a time interval and if the oral cavity will be well-groomed, the restoration will make you happy for many years. Componeers have a shape approximating to the Hollywood smile. They are manufactured as in the color of bleached teeth, and the natural color. The most optimal variant of acquisition of a new smile is the installation of componeers on six front teeth. This procedure lasts between 4 to 5 hours in a single visit. You can also combine the installation of componeers on the upper jaw with whitening of others teeth by modern Zoom system. Patients with correct and complete bite, but ashamed of their smile due to changes in the shape and color of the front teeth. Patients who have little time, requiring quick results. Patients dissatisfied with the quality of the restorations of front teeth. The first step before installing componners is to determine the color. Then, if required by the condition of your teeth, small dissection. The next step is to "pasting" componeers by special composite. ZOOM – snow-white smile in one visit! Effective system for tooth whitening! Confirmed by scientific studies! Lightening of teeth by 8-12 shades. The long-term effect of up to 5 years! Most modern and most gentle whitening nowadays! Extra-white teeth for extra-advantageous price. Alternatively, also offer home whitening, for which we make according to your measurements the individual mouthguards and select for you night and day gels. The effect of home whitening is achieved after 5-6 treatments. We offer extra teeth whitening in cases of sudden major events in your life – a love rendezvous, a business meeting, a photo shoot, shooting on television. Just call by phone +420 776 428 606 and on the same day you will look perfect. For couples who marry, we offer the first in their family life discount on teeth whitening "12 shades of white". You can also buy from us a gift certificate for the ZOOM whitening. The snow-white smile – a great gift for newlyweds, jubilee, alumni and for friends under the Christmas tree. To whitening teeth there are a number of contraindications, necessary to consult with a clinic specialist . Wonderfull news for our patients! We have acquired innovative equipment Acteon! With its help, professional oral hygiene iscarried out as efficiently as possible, painless and non-traumatic for the teeth and gums. The autonomous reservoir allows use of an antiseptic liquid in aseptic conditions. Fluorescent indicators help to the doctor to see dental calculus even in the most difficult areas. Removal of tartar is carried out is preservation and non-traumatic in case of inflamed and bleeding gums. Also, this device major indication for use in cases of patient with sensitivity teeth. Special settings are provided a painless procedure of oral hygiene. You can Call us, and on the same day you will be given immediate dental help. Usage of microscope in dental treatment! Using a microscope we can also find additional canals' branch during their treatment, that is impossible without using only the optical zoom. Increased chances of successful canals' retreatment. The possibility of removing of foreign bodies from the canal (broken tools, metal pins). Providing a positive long-term prognosis after treatment. 1. Initial root canal treatment is necessary when the infection is due to caries has penetrated into the tooth cavity and cause inflammation of the nerve. 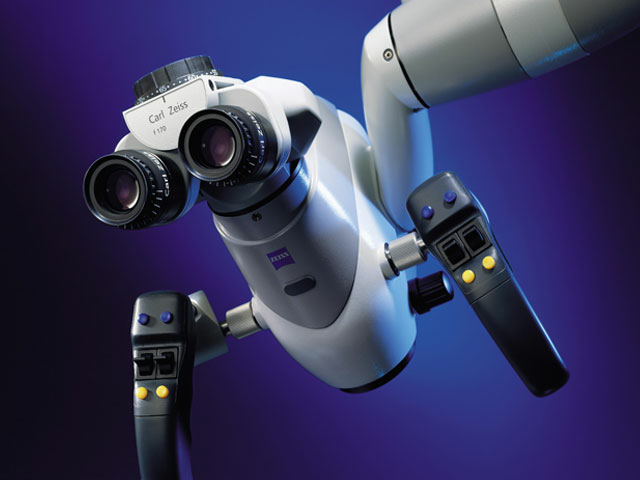 In this case, under the control of an operating microscope is carried out creating rectilinear access to the root canals, their consistent passing hand, and then the processing by machine tools.All stages of treatment are carried out under the control of computer anesthesia Wand. is a combination of optical zoom and soft ultrasound, which allows high-quality processing and sealing of root canals with the preservation of healthy dental structures to the maximum extent. The cost of channels treatment from 85 euros. 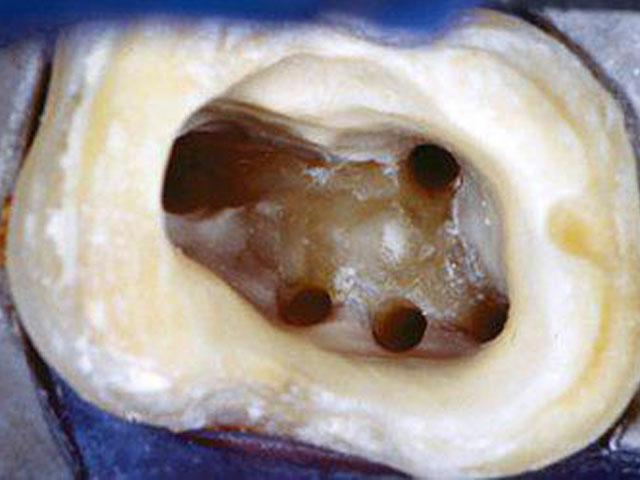 The final step is the use of three-dimensional technique of filling root canals by Schilder that helps to ensure long-term and reliable the final result. 2. Root canal retreatment is necessary, when the infection from the root canals, that were not completely are sealed, either not found, penetrated into the bone tissue surrounding the apexes of roots.In this case, under the control of an operating microscope performed unsealing root canal, extraction from root canal foreign bodies (pins, fragments of tools, remnants of cement fillings). During retreatment channels follow the strict protocol of instrumental medical processing and then into processed channels is put a therapeutic drug based on calcium for their disinfection for a period of 2-4 weeks. In the absence of inflammation symptoms is possible to move on to the final root canal filling. 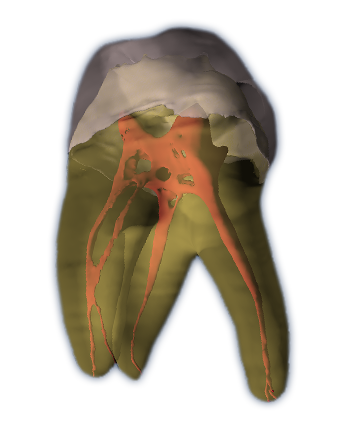 Analysis and planning of retreatment of root canals must be conducted with the use of computed tomography. Individual approach to each patient, ongoing dialogue doctor-patient, the demonstration of each treatments stage, the active participation of the patient in the treatment process. 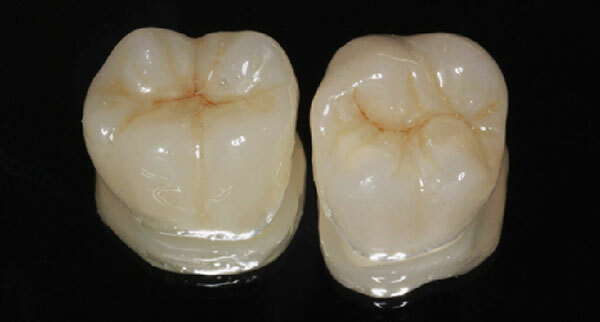 the destruction of teeth crowns less than ½ of their volume - used light nanocomposites. The cost of filling from 50 euros. Nanocomposites have a good polishing and recover small and medium sizes defects, allowing simulate natural anatomy. The cost of fillings is 200 euros (5400 Kč). Ceramic filling on the structure and strength is identical to the natural tooth enamel, allowing to achieve excellent esthetic results and long-term life of restoration . fiberglass pins, that are fixed in the channel and are the continuation of the root for a more uniform load distribution on the tooth followed by coating with ceramic crown. 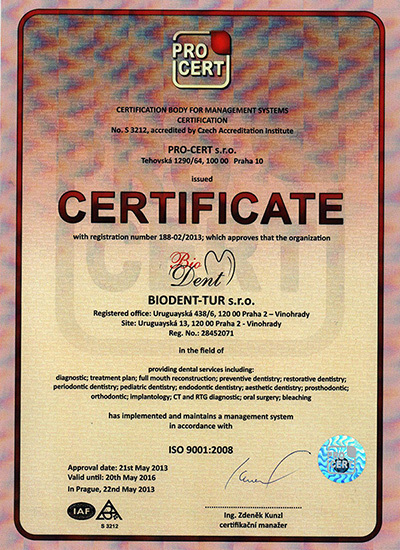 Copyright 2009–2019, Dental Clinic in Prague Bio-Dent tour s.r.o.